Listen in as one church tells the story of getting their Christmas events out to a few thousand people during a town Christmas event. 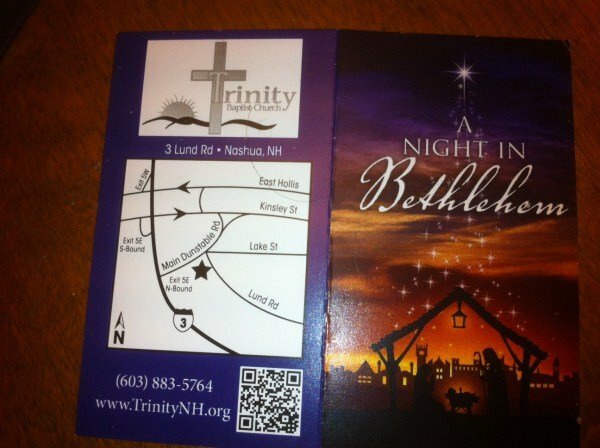 I interview Kevin Cunningham, outreach pastor of a church in Nashua New Hampshire, a town of about 80,000. Each year on the Saturday after Thanksgiving, the city turns Main Street into a walking district. Close to 30,000 people from across New England visit downtown Nashua to officially kick-off the Christmas season. The evening starts with a procession from City Hall to Railroad Square where the City’s official Christmas tree is lit. Much of the downtown is closed to traffic for the evening, allowing strollers to enjoy the live entertainment, sample offerings from street vendors, dine in downtown’s fine restaurants and do holiday shopping at specialty shops and boutiques. 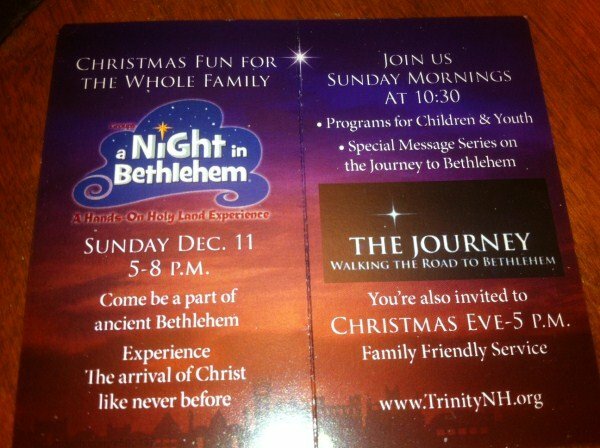 This church used this event to promote two Christmas activities. Group’s A Night in Bethlehem—converting our church grounds into a first-century experience of what Bethlehem must have looked like on the first Christmas. Our Christmas Eve service—that will feature a lot of drama vignettes, special music and group carol singing. Kevin also shares what was on their table as giveaways. 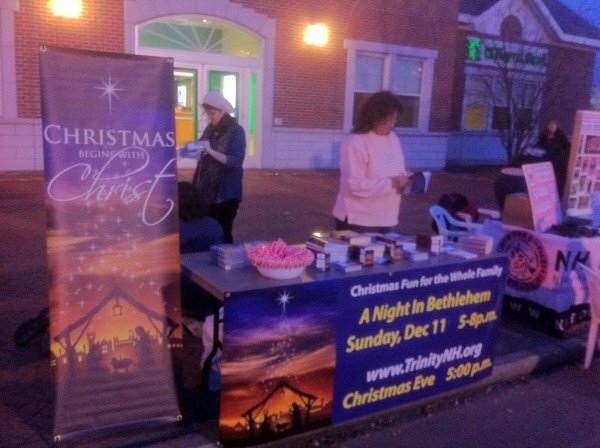 Booklets (from Outreach Marketing) with the Christmas Story and a message for non Christ-followers that presented the Gospel and a message for believers who are not in fellowship. Besides marketing the Christmas activities, the volunteer team was also intentional about faith sharing conversations. Make sure you listen in to see how they held normal conversations during this Christmas outreach. Read 7 Habits for Highly Effective Personal Evangelism to get a feel for what this might look like. a parent needing help raising a middle schooler and looking for a church with a good youth group. A number of people who had drifted away from church over the years and sensing the need to get back on track. Some were believers—others from a ritualistic background and looking for something more meaningful. How did you prepare your volunteers for this table? How are you preparing your hospitality and church member to receive them and make intentional connections? Finally, Kevin shares some practical principles he learned doing this kind of outreach and the one thing he would do differently. Find areas or events that already exist in your area where you can generate interest. Don’t say no for people. Even though our town’s event is called the “Winter Holiday Stroll” they included a section for non-profits that we were able to take advantage of. Start early. Our application had to be filed by mid-September.